It is that your reputation matters and it is there for all to see at the click of a button. Online reviews are big business because people are happy to put their faith in a company based on the opinions of others. In digital marketing, if a review comes from social media then this is often referred to as social proof – but with so many review websites out there it can be a minefield knowing which ones to focus on and which ones will actually make a difference to your business. Which Reviews Matter To My Business? The simple answer and the truthful answer is that all reviews matter to your business to some extent and they can even be helpful in terms of search marketing. The higher the cost of your product or service the more important a review becomes to your company. Say for example I am looking to buy a Thundercats mug and I end up on Amazon – I already trust the e-commerce site so I just want to check the quality of the product – so I am just going to read the reviews on the page or maybe even just look at the overall star rating. If I am buying from an independent site that I don’t know then I might look around for trust icons or reviews/testimonials on their site – but the chances are with the product costing £5-£10 I am going to be willing to take a risk. 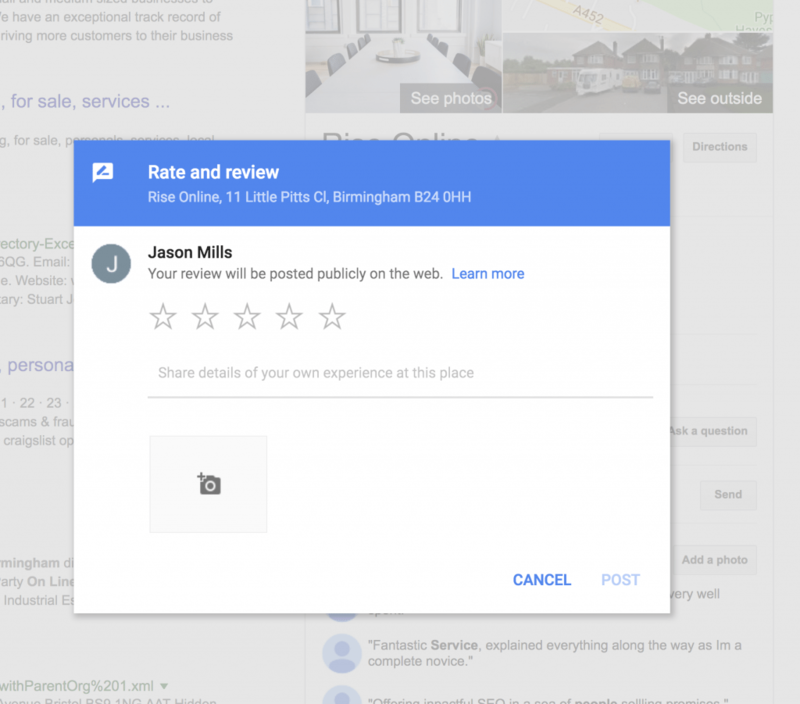 On the other hand, if you are a builder providing loft conversions at a cost of around £20,000 I am going to want to check a much higher number of reviews and from a number of sources – however my starting point for this will probably be the company website and then Google. So essentially, the reviews that matter will depend on how much trust someone has to put in your business in order to become your customer. For a builder or high ticket price company I would suggest to Google your ‘company name + review’ and go at least 3 pages deep. For companies who need less trust then covering page one is probably sufficient – as well as any industry standard websites. For a restaurant Trip Advisor and Open Table are going to be key places to gather reviews. For a roofer it might be ‘Best Rater’ and Check A Trade. For all businesses you will want to have an active and fully optimised Google My Business account and be collecting reviews there. And of course, good old Facebook is also great for that social proof. How To Get The Most From Google Reviews? Google is pretty much the go to place for most people searching for a service or product. The great thing about Google is that you will show up for your brand name, so if someone is searching for your business they will be greeted by your full business details and your reviews and star rating (out of 5). It will also display this in the local search results in the map pack. 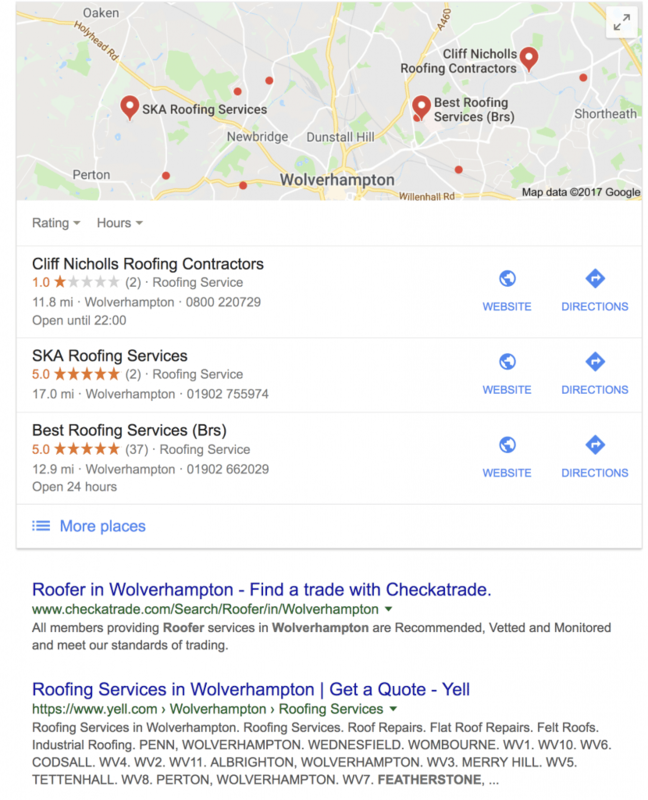 Guess who is going to get the most calls from this local search for ‘roofers in Wolverhampton’! It is also interesting to note in this example that Check A Trade and Yell.com are the first two organic results so Best Roofing Services (which has 37 5 star reviews) might want to focus on getting reviews there. From there, a potential customer might type the brand name in to Google. 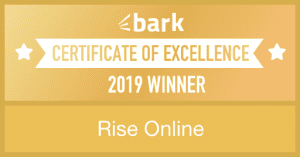 For this particular brand you are greeted by their own website in first place, followed by an award from ‘Best Rated’ – even more social proof. Those Google reviews are also displayed prominently on the page and so everything ties together. 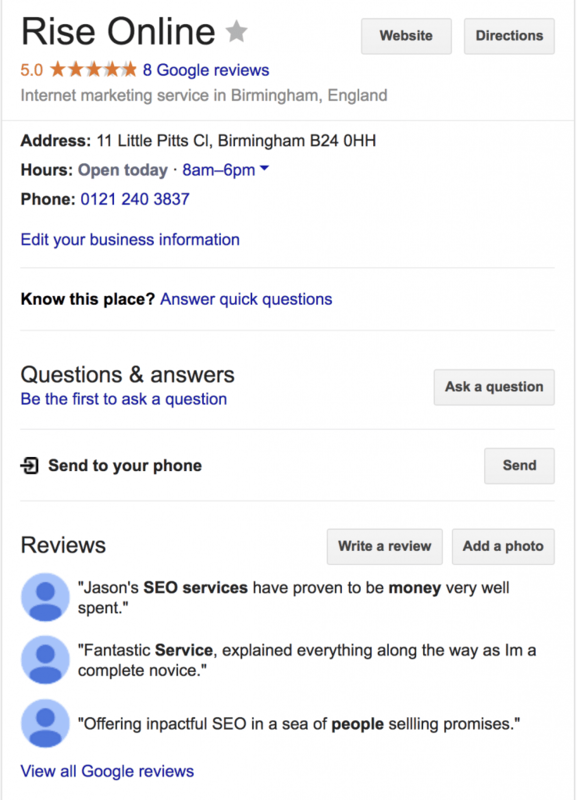 To get the most from your Google reviews you need to work at it. We recently (April 2017) rebranded from Brum Design SEO to Rise Online and of course none of our 5 star reviews from the old brand were transferred to the new – as we wanted to run the two companies at the same time for about 12 months. This is how our reviews look now. So we have recently had a push on gathering reviews from the new clients we have worked with this year. Now, like most people, our clients are extremely busy and we need to make it as easy as possible for them to leave the review. Unfortunately, Google My Business does not make it easy to create a link to your GMB review page. Whitespark.ca is a tool that we use quite extensively when working with local businesses to identify citations. But they also have an excellent free tool that is super quick and easy to help you generate a link to your Google My Business review page. Try the Google Link Generator here. It couldn’t be easier for your client/customer to leave you a review. Finally, to get the most from your Google reviews (and any others that allow this) you should respond to them. Not only does it make the customer feel like you have acknowledged their effort of leaving a review (and hopefully encourage them to leave one somewhere else) but it also shows potential new customers that are reading your reviews that customer service matters to you. Not to mention that Google loves people interacting with it’s GMB pages so it is fair to assume that you would gain a small map pack ranking boost from this. 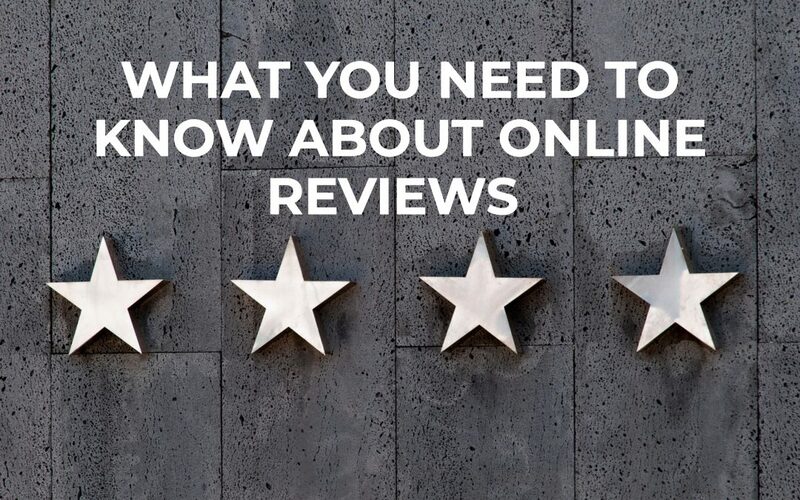 If you are struggling with building your local reviews and would like some help to find ways to better encourage your customers to leave reviews for your site or perhaps you need help setting up your Google My Business profile head to https://riseonline.co.uk and get in touch today. For more posts about SEO you can head to our Rise Online Google Plus.